Ford Fiesta 1.0 EcoBoost in Chiang Mai, Thailand. This is the heart of Fiesta EcoBoost, The engine won the International Engine of the Year 2013, which is predicted by Ford and have the energy level greater fuel efficiency. From the exterior, the Fiesta EcoBoost did look very similar to his brother, both hatchback and sedan models. The difference in appearance is only seen in the rear lights which added a touch of chrome and minor changes under the front fog lamps. But the biggest difference is presented by the use of different machine is touted as one of the 1.0-liter engine in the world. This is what makes me feels impatient to know how much of the difference. On the first occasion, we get EcoBoost Ford Fiesta hatchback as the first car to try. 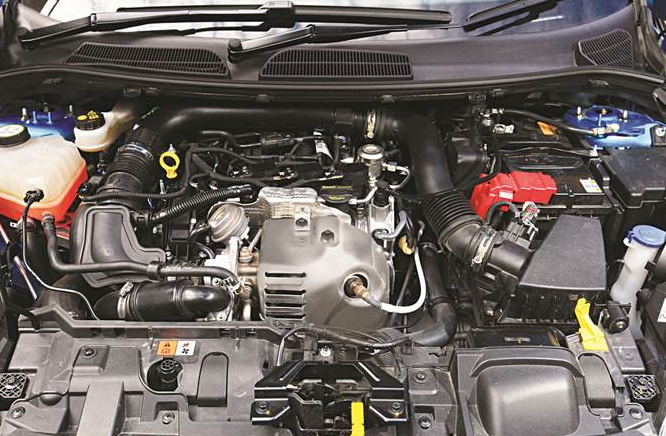 Under the hood Fiesta EcoBoost, 1.0-liter engine stuck gasoline is supported by the turbocharger. Tests were conducted on the streets of Chiang Mai can be quite complete, straight street, corner variations, rise and fall with a total of 236 km of testing so far can be fairly common to describe the ability of this car. At the beginning of a journey that began from Hotel Holiday Inn Chiang Mai, we were immediately confronted with a straight track, and aggressiveness EcoBoost combined with a 6-speed automatic transmission provide acceleration was impressive. Claim acceleration 0-100 kph which can be reached only by 11.4 seconds is not impossible can be achieved. This car was more aggressive than the Fiesta 1.5-liter engine. 1.0-liter engine combines direct injection technology, the turbocharger and variable valve not only result in spontaneous labor, but also the maximum fuel efficiency. Engine compression 10: 1, of course, require the intake of fuel with 92 RON to maximize its capabilities. Although claimed to still be chugging air-RON 88 petrol is currently marketed in Indonesia, but it certainly will not make optimum engine performance and impact on engine durability. Entering the uphill and winding streets Fiesta also gives the impression that pretty awesome. The maximum torque of 170 Nm EcoBoost engine that already can be obtained at 1400 rpm, not only provide the necessary impetus in the face of street terrain, but also fuel efficiency thanks to the relatively low engine speed. Claim the Ford Fiesta EcoBoost fuel consumption can reach 18.9 kpl. The peak power of 125 hp at 6,000 rpm also provides the ability to easily reach high speeds while facing straight back streets. The key to the efficiency offered by the Fiesta, these include the use of high-speed small turbochargers which can spin up to 248,000 rpm. Beyond providing instantaneous response performance, but at the same fuel economy. Next is the split system cooling, a method that allows the management of the engine coolant temperature followed two paths, one to the cylinder block and the other leading to the cylinder head. This makes the engine heat faster so that more efficient fuel consumption and low emissions. In addition, the exhaust manifold on the EcoBoost engine has also been integrated with the cylinder head. With printed directly into the cylinder head - do not just stick like a machine in general - it can cut up to one kilogram of engine weight, as well as ensuring the fuel and air mixture is optimized so that helps warm the engine faster. This of course resulted in fuel savings and a more responsive engine. After traveling as far as 90 miles, in the Botanic Resort Chiang Mai, we exchanged our hatchback sedan was driving the Fiesta EcoBoost labeled 'Titanium'. There was no difference in technology between the two other than the different shapes and dimensions. 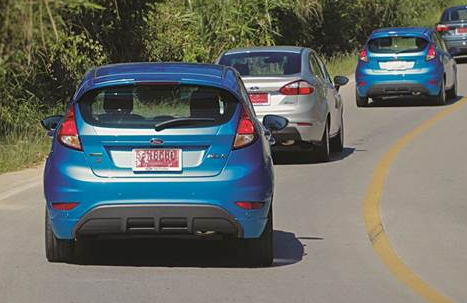 The increase in weight due to the addition of the Fiesta sedan trunk barely distinguish the performance it offers. As offered in the previous Fiesta, Fiesta EcoBoost behind her still offers a fun chassis control. Not to mention the additional features of the Electronic Stability Program (ESP) and Pull-Drift Compensation sufficient to provide assistance to the driver in controlling the car. Features Pull-Drift Compensation own work to detect the condition of the road surface or the convex side wind, and adjust power steering Electric balance that helps the driver control the Fiesta. Behind excellence embedded in the EcoBoost Fiesta, this car is very unfortunate not offer paddle shift as one of the driving features. Despite using a power shift in the form of the (+) and (-) to move the gear lever mounted on the transmission, but still give the sensation of driving is not as much fun using the paddle shift. Another one is about the automatic door lock. unlike some rivals in its class, the door locks do not lock the Fiesta was automatically if the car has been running. It was not a big deal, but enough to give a sense of security when driving. 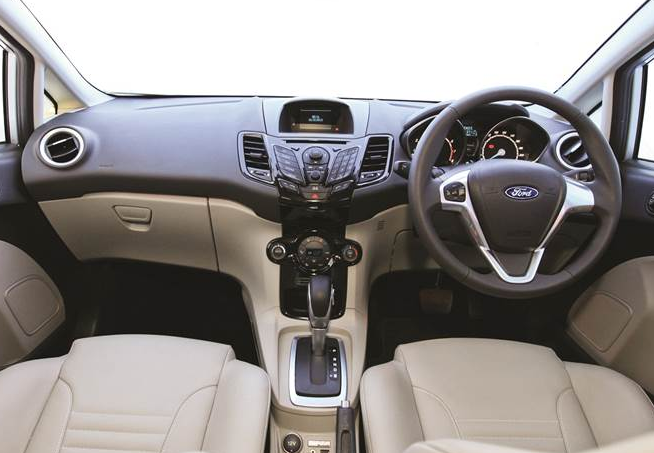 In the interior, the cabin is the same as the old model Fiesta. 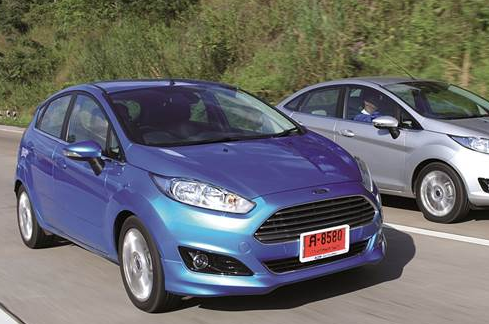 In his seat, leather-clad Fiesta EcoBoost partial that gives the impression of sporty. In addition, communication and entertainment technology flagship Ford SYNC to connect drivers with smartphones is also one of the selling points of this car. Overall, the Fiesta EcoBoost into a car that presents the most comprehensive advanced features in its class. Use the Start / Stop, Smart Keyless Entry, Electric Power-Assisted Steering (EPAS), dual airbags, Electronic Stability Program (ESP), Rear Parking Sensors, as well as Hill Launch Assist is a series of features that you would get.